Egypt's Abdallah El Said has joined Finnish club Kuopion Palloseura (KuPS) on loan from Al Ahly for two months. He looked set to join Ahly's archrivals Zamalek last month before changing his mind and rejecting the move. Despite the change of heart Al Ahly chose to sell the forward and after his loan to KuPS the 32-year-old will join Al Ahly Jeddah in Saudi Arabia. Ahly official Adly Al Qaie said he has been allowed to move to prove his fitness for June's World Cup in Russia. KuPS are also pleased with their acquisition. 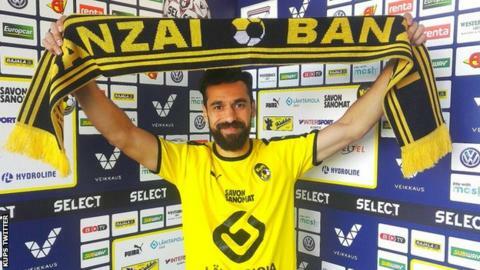 "Abdallah is a big name and very high-level player, we are happy to have him here," KuPS sporting director Konstantin Shipulin said. "Al Ahly's managers were also very professional and open to co-operation. "We wish Abdallah good luck and wait for him on the field and believe he will be a key player at the World Cup, "
Prince Turki Bin Mohamed Al-Faisal the president of Saudi club Al Ahly of Jeddah announced last week they reached an agreement with Al Ahly to El Said on a two-year deal starting next season.